A strong and proper pencil grasp is essential in order for kids to produce efficient and neat written output. 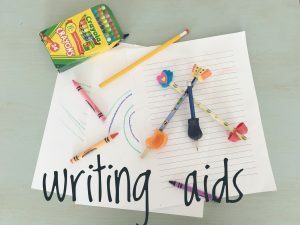 Pencil grips are writing aids that can be really useful for kids who struggle with holding their pencils properly. Pencil grips are a school Occupational Therapist’s best friend, and we all have a stash of different types of pencil grips in our work bags. If you enter “pencil grips” into any search engine, you will find that there are at least a few dozen types of pencil grips on the market. Today, I review three types that I find myself frequently using, and the pros and cons of each. Pencil grips alone will highly unlikely strengthen your child’s hands or promote age-appropriate fine motor skills, despite claims made by their manufacturers. I like to use pencil grips as “means to an end” versus the end itself. That is, I use them to train and each kids how to hold a pencil efficiently in addition to other fine motor work I recommend based on individual needs. My ultimate goal is for kids to have an efficient grasp withoutthe grip. Some children grow really used to the grip, and if they wish to, they can continue to use it. If you are not persistent with your child, your child will likely take the grip off the pencil or lose it, or both! This is the most popular one to use with younger children. It is definitely the one I like to start with. This pencil grip is bulky and thick, which makes it much easier for children’s little fingers to get a good grip on it. The “wings” at the top of the grip keep the fingers in place, and prevent the fingers from crossing-over (hence its name, “cross-over grip”). I really like this one too, and I have had good success with kids as young as 4 years old being able to use it (they comes in different sizes). 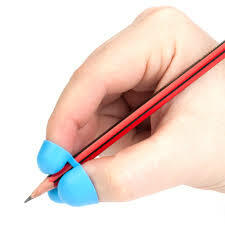 It’s very intuitive because unlike other grips, this grip has three holes, which means you can only use three fingers to hold your pencil. I’ve seen kids come up with all sorts of ways to hold other grips incorrectly or even using them upside down, but with the Writing Claw forces them to use a tripod grasp. The only problem I have seen is that kids have a hard time figuring out which finger goes in which hole, and what I have done to solve that problem is using a sharpie marking each hole with T I or L for “Thumb, index and Long” fingers. The pencil grip already has those letters marked on there, but they are very hard to see for younger kids. Plus, the stronger visual cue will remind them to place their fingers in it correctly. This is the most standards grip, but also my least favourite one to use with young children. In fact, I have only ever use this with kids or are 10 or older because this pencil grip is smaller and more “discrete” looking, and older kids are more motivated to use it than other grips. However, even in that case, kids may forget and hold it upside down, or put the wrong finger on the wrong side of the grip (the grooves are different sized and each side is designed for a specific finger). 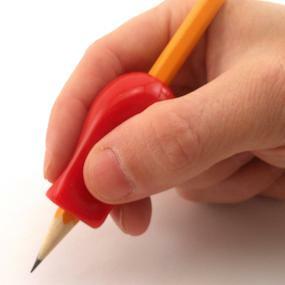 They may also just revert to holding their pencil the way they used to on top of the grip. Remember, pencil grips alone are unlikely to fix any issues your child is having with printing or fine motor skills. Pencil grips are always used in combination with other exercises or activities prescribed by your Occupational Therapist. If your child is struggling with achieving an efficient grasp, an Occupational Therapy assessment is definitely warranted. Contact me today to schedule a free 20 minute phone consult to see how I can help!